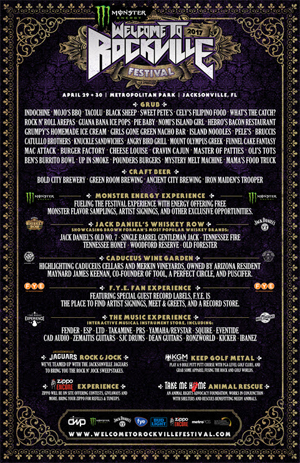 April 29 & 30 At Metropolitan Park In Jacksonville, Florida The daily band lineups--including the addition of OF MICE & MEN--and a variety of onsite festival experiences have been announced for the 7th annual Monster Energy Welcome To Rockville, Saturday, April 29 and Sunday, April 30, 2017 at Jacksonville, Florida's scenic Metropolitan Park along the St. Johns River. 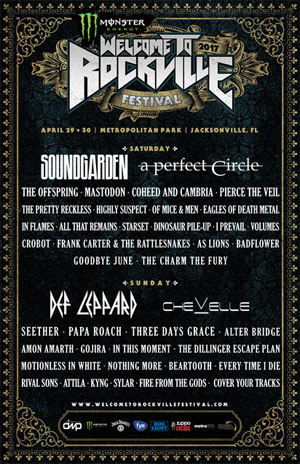 Rock legends SOUNDGARDEN, DEF LEPPARD, and A PERFECT CIRCLE lead the music lineup for Florida’s biggest rock experience, which features over 40 bands on three stages, including a tremendous list of talent with THE OFFSPRING, MASTODON, CHEVELLE, SEETHER, PAPA ROACH and many more. Visit www.WelcomeToRockvilleFestival.com for all the details and to purchase tickets. Zippo: Zippo Encore will be back in action at Welcome To Rockville with a full stock of Zippo lighters, including the limited edition festival designs! Come by and check out their contests and giveaways or get a free lighter fill or tune-up. Be sure to bring your Zippo lighter to the festival, it could be your ticket to special experiences. Jacksonville Jaguars Rock 'N Jock: Welcome To Rockville and the Jacksonville Jaguars have teamed up to bring you the Rock N’ Jock Sweepstakes. Beginning on March 6th, enter for a chance to win a pair of VIP passes to Welcome To Rockville, a meet and greet with DEF LEPPARD, two Jacksonville Jaguar jerseys, a pair of tickets to a Jaguars 2017 home game of your choice and more. For more information, visit www.WelcomeToRockvilleFestival.com. Food Experience: Restaurants serving at Monster Energy Welcome To Rockville will include: Black Sheep (modern American cuisine using fresh, local ingredients), Indochine (voted Jacksonville’s “Best Thai”), Mojo's BBQ (unique barbeque experience), and TacoLu (the Bangin’ Bus serving Bangin’ Shrimp tacos, and other TacoLu classics). Additional food vendors include: Angry Bird Grill, Ben’s Burrito Bowl, Brucci’s, Burger Joint, Catullo Brothers, Cely’s Filipino Food, Cheese Louise, Classic Home Cookin’, Cravin’ Cajun, Funnel Cake Fantasy, Girls Gone Green Nacho Bar, Grumpy’s Homemade Ice Cream, GuanaBana Ice Pops, Hebros Bacon Restaurant, Island Noodles, Knuckle Sandwiches, Mac’ Attack, Mama’s Food Truck, Master of Patties, Mount Olympus Greek, Mystery Melt Machine, Nomi's Island Girl Foods, Ollie’s Tots, Pele's Wood Fired Pizza, Pie Baby, Pounders Burgers, Rock N’ Roll Arepas, Sweet Pete's, Up In Smoke, and What’s The Catch Fish Tacos. Craft Beer: The Monster Energy Welcome To Rockville Craft Beer selections will feature top breweries from the region, including Jacksonville's Bold City Brewery (Duke's Brown Ale, Orange Screamsicle), Jacksonville Beach's Green Room Brewing (Head High IPA, Count Rock-U-La), St. Augustine's Ancient City Brewing (AC/BC — Back In Black Cherry Ale, Matanzas River Red Ale) and many more to be announced.